Folk Islam is a movement flourishing in many Muslim countries. It may be characterized by the veneration of saints, tomb worship and animism. You will see elements of this throughout the country. 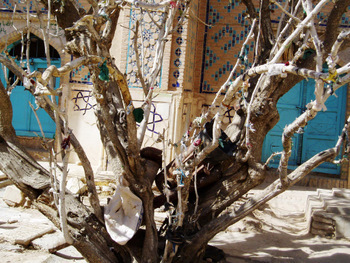 For example, the picture above is a tree in Mazar with nails tied to it to ward off evil. Read one story of an Afghan woman's folk religion practice. First, they assume that the seen world is related to the unseen world. Humans are thought to be controlled by spiritual forces, whether Jinn, fate, curses, or the evil eye. They in turn seek to appease the powers through sacrifices, ritual, and to protect themselves through charms and amulets. Second, they believe that all of life is interconnected. People are intimately linked to their families, some of whom are living and some who have already passed into the spiritual realm. Third, they seek power to control the affairs of everyday life. The essence of this worldview is power..power of an evil eye to kill a newborn or ruin a harvest, power of the Jinn to possess an enemy, power of curses to control human events, power of impersonal forces to heal a child or make a person wealthy. The challenge remains to understand their worldview in the context of their cultural practices (which do change from Islamic country to the next), as well as to bridge their worldview from your own. This will be a challenge, depending upon the language ability you may have, as well as the literacy of the person to whom you are speaking. It will also be helpful to learn the associations between the fears of Folk Muslims and which folk religious custom is practiced. The following table will be helpful, especially in the Afghan context.